"Visit of Fr. Robert Sheridan"
Group photo taken on the occasion of the visit of Fr. Robert Sheridan, MM. Bp. 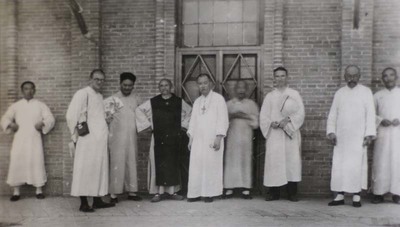 Souen (Sun Dezhen 孫德楨), center: to his right: Fr. Vincent Lebbe, Cheng Pao Tang (? ), Fr. Raymond de Jaegher with a book his left hand: to the bishop’s left: unknown, Fr. Robert Sheridan with colonial hat under left arm, Fr. John-Baptist Wang, new rector of the minor seminary and next vicar-apostolic, a Chinese priest. Visit of Fr. Robert Sheridan. July 1933. Société des Auxiliaires des Missions (SAM) China Photograph Collection, Whitworth University Library, Spokane.